We’ve all done the haphazard Googling of symptoms and ailments that afflict us and know what such efforts typically yield. For example, worrisome time spent on obscure message boards, or painstaking precision identifying the area of discomfort on the WebMD digital dummy. Yes, many an algorithm has inflicted fear in the heart of hypochondriacs by somehow associating that rash with a terminal liver disorder. But is it any surprise why we’re turning to online sources for help? While the Affordable Care Act, has aimed to make healthcare more…well, affordable…it hasn’t necessarily become more accessible. The ACA brought many more people into a healthcare system already facing a shortage of primary care physicians. And with the average scheduling wait time being 14 days or longer (average of 20 days or longer for family practice), it’s no wonder why we’re consulting Google instead of actual doctors. Enter telemedicine. Employers are continually seeking solutions that battle the rising cost of healthcare. In order to effectively do this, employers must reduce barriers to quality of care, including time way from work, travel time, and office visit fees. Telemedicine provides patients with the option to seek medical consultation for acute care needs. By increasing access to around-the-clock care, employers can help reduce the total number of urgent care or emergency room visits for non-emergent issues, while still offering treatment to patients at the first sign of illness. Extending Clinic Reach - When employees are traveling for work or vacation, access to acute care is often overlooked. Telemedicine gives patients access to a nationwide network of board-certified physicians, allowing them to quickly receive treatment and fill prescriptions at a local pharmacy. In addition, if an employer offers and on-site clinic at their headquarters, they can extend the benefit to outside divisions by offering telemedicine to those locations. Extending Clinic Hours - On-site clinics (and mainstream doctor's office) are most commonly open during business hours, so when a need comes up at night or early in the morning, employees are left to turn to urgent care or going to the ER. With telemedicine, patients have access to 24/7/365 care. Clinic Integration - Telemedicine data is synced with the Electronic Medical Record (EMR) in the CareATC system. This allows our clinic team can follow up with the patient at their next clinic visit. 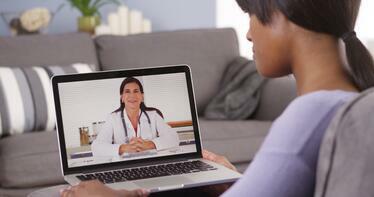 Telemedicine is highly convenient – a prime reason for it’s rise in popularity. And the future of telemedicine is looking bright. One of the largest health insurers, United Healthcare, is providing coverage for video-based doctor visits in the same way it covers in-person visits. These virtual doctor visits conducted by various third-party vendors and is currently available to UnitedHealth’s self-funded customers and they plan to expand to most members by 2016. By offering telemedicine services, insurers save on costly urgent care visits by eliminating traditional overhead costs associated with these types of visits. Furthermore, these telehealth services free up hospitals and urgent care centers to focus on patients who truly need in-person care. Self-insured employers achieve the same benefits and then some. Telemedicine is no longer the exception, but the rule in providing around-the-clock care. Thankfully, affordable services exist to provide employees with access to care when they need it most. Providing this service increases access to care while reducing the cost of non-urgent visits to the emergency room. Make the right call and ensure employee care includes all the benefits of telemedicine.